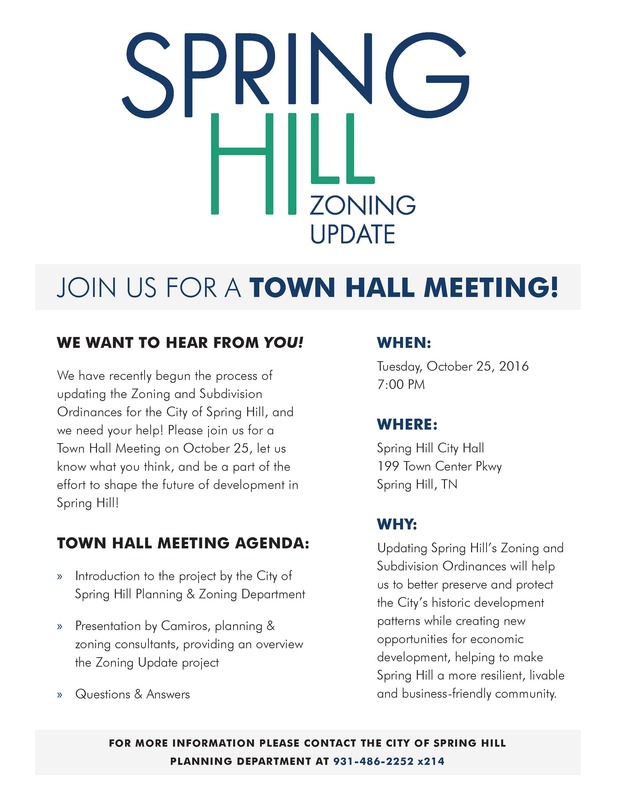 Citizens are invited to be part of one of Spring Hill's most important steps in balancing our city's continued growth, property development, job creation and quality of life, by attending a town hall meeting at 7 p.m. Tuesday, Oct. 25, at City Hall. The City recently began what will be a year-long process of updating our Zoning and Subdivision Ordinances by hiring Camiros, a planning and zoning consultant, to oversee this project. The town hall meeting agenda includes and introduction to the project by the Spring Hill Planning and Zoning Department; an overview presentation by Camrios of what to expect during the zoning update; and a public question and answer session.